View More In Strut Compressors. 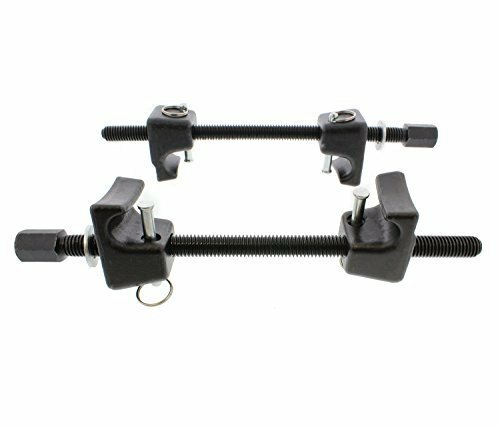 If rough roads have you down, the ABN 11.5" Inch Strut Spring Compressor Tool - Set of 2 (Pair) - MacPherson Spring Compression, 13/16" Socket 1/2" Drive is a safe and easy way for you to replace the springs and the struts on your vehicle when your ride is not smooth. It takes tension off to safely remove strut and spring assembly. Quickly and safely compresses the coil spring for replacing a shock absorber unit or spring as well as allowing safe and easy repairs on bent struts, strut tubes, and damaged pieces. This compressor is universal for struts assembly that remove from the vehicle to transfer the old spring on the new strut and can be used with a 13/16-inch socket or 1/2-inch drive. Package includes a pair (2) of compressors and carrying case. WARNING: This product can expose you to chemicals which is [are] known to the State of California to cause cancer and birth defects or other reproductive harm. For more information go to www.P65Warnings.ca.gov.